Sorry if this looks a little gross. I found it quite interesting to see five pounds of fat compared with five pounds of muscle. 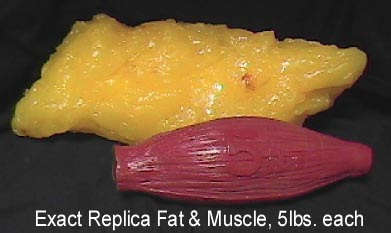 The muscle is so much more compact than the fat. I have done a fair bit of reading on the Facebook P90X group and there seems to be this common issue that people (mainly women) have where they "have lost 10 inches, but my weight hasn't changed, what am I doing wrong?!". Well boo hoo! Haha. Look at this picture and realize that muscle weighs more than fat and takes up a lot less space than fat. Realize that you can't get hung up on the scale. I think that weight is a pretty poor measure of physical gains from exercise. I don't take much stock in the number on my scale. I keep track of it because last year when I didn't keep track of it all of a sudden I was about 8-10 pounds than I was the last time I weighed myself and realized that I had thyroid problems. I want to make sure I keep on top of my health, but I know right now I am at a healthy weight. I just want to get stronger and more flexible.